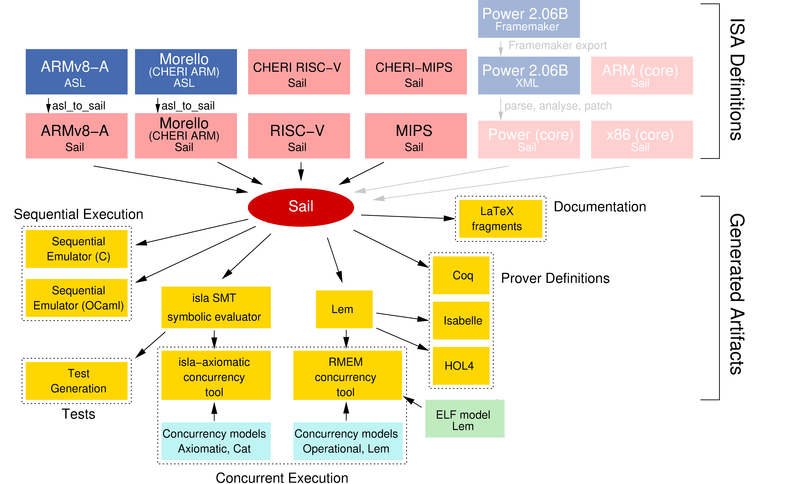 Sail is a language for describing the instruction-set architecture (ISA) semantics of processors. Sail aims to provide a engineer-friendly, vendor-pseudocode-like language for describing instruction semantics. It is essentially a first-order imperative language, but with lightweight dependent typing for numeric types and bitvector lengths, which are automatically checked using Z3. It has been used for several papers, listed below. Given a Sail definition, the tool will type-check it and generate executable emulators, in C and OCaml, theorem-prover definitions for Isabelle, HOL4, and Coq, and definitions to integrate with our RMEM tool for concurrency semantics. This is all work in progress, and some theorem-prover definitions do not yet work for the more complex models; see the most recent papers and the ARMv8.5-A model for descriptions of the current state. The Sail source and documentation are available from a github repository, and as an OPAM package as described there. Sail ARMv8.5-A ISA model, automatically generated from the ARM-internal ASL reference, as used in the ARM ARM. Sail ARMv8.3-A ISA model. This is the "public" model described in our POPL 2019 paper, now largely superseded by the above. Sail ARMv8-A ISA model, handwritten. This is a handwritten user-mode fragment. Sail RISC-V ISA model, handwritten. Sail MIPS and CHERI-MIPS ISA models, handwritten. Sail IBM POWER ISA model, automatically generated from IBM XML documentation. This is a user-mode fragment. Sail x86 ISA model, handwritten. This is a handwritten user-mode fragment. The hand-written ARMv8-A, IBM POWER, and x86 models are currently not in sync with the latest version of Sail, which is the (default) sail2 branch on Github. These and the RISC-V model are integrated with our RMEM tool for concurrency semantics. This work was partially supported by EPSRC grant EP/K008528/1 REMS: Rigorous Engineering for Mainstream Systems, an ARM iCASE award, and EPSRC IAA KTF funding. Approved for public release; distribution is unlimited. This research is sponsored by the Defense Advanced Research Projects Agency (DARPA) and the Air Force Research Laboratory (AFRL), under contracts FA8750-10-C-0237 ("CTSRD") and FA8650-18-C-7809 ("CIFV"). The views, opinions, and/or findings contained in these articles OR presentations are those of the author(s)/presenter(s) and should not be interpreted as representing the official views or policies of the Department of Defense or the U.S. Government.